You should have come from the fabulous Bree Renwick’s post to get here and from here you can click on “next” and get to Dani Dziama’s amazing work! If you missed Bree either select the “back” button to get there or go all the way around the hop to get back to her. I started with a Baked Brown Sugar Cardstock base and used the Soho Subway DSP again. I brought in some Pink Pirouette in the pennants to match her cute little bathing hat. I did some sewing on the page, sewing down the pennants over the large piece of Soho Subway grid image. The stamp set I featured is “By the Tide” and I gold embossed the seashell image, cut it out and popped it up. I also stamped the sea fan image in Whisper White Craft Ink on the base and again on a piece of scrap. I cut out the scrap, sponged and added Gold Lame Smooch Ink to the edges…..soooo pretty! I hope you love this page as much as I do and make a beautiful page of someone you love today too! 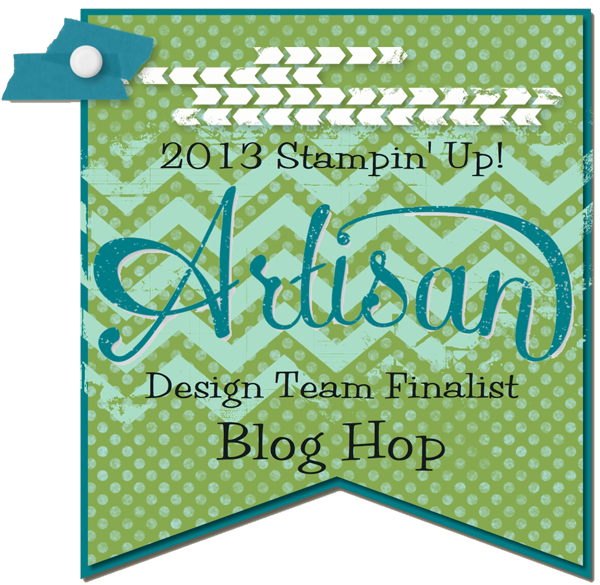 Make sure you check out all the fabulous projects created by the finalists by going through the hop! Select “back” to see Bree Renwick’s fabulous work and select “next” to get to Dani Dziama’s amazing projects! You do not want to miss a thing!!! 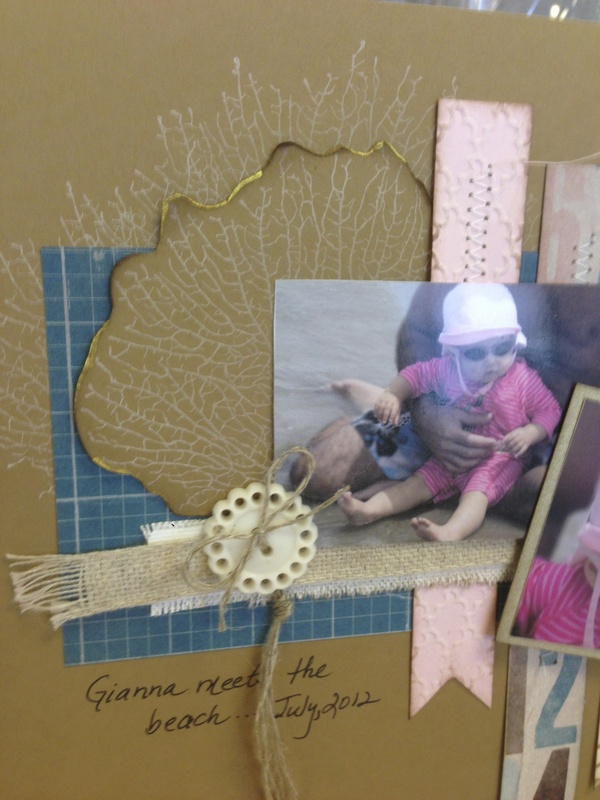 This entry was posted in 2013 Artisan Design Team Finalist, Scrapbooking, Stampin' Up, Techniques, Vintage by kate80132. Bookmark the permalink. I LOVE this page 🙂 What a sweet baby girl you have for a niece! This IS a beautiful page … with you darling little beautiful niece! Isn’t it great when we feel like we “nailed” the perfect accents to a favorite picture of a favorite person? You DEFINITELY nailed this one! This page is fabulous! I had to enlarge it to see some of the details and I love all of the gold accents. It really makes it pop. Beautiful! The gold accents are the perfect addition!